Snow White or Simba? Mickey or Maleficient? Arial or Anna? Elsa or Eeyore? Whoever yours are, everyone has some favourite Disney characters that they’ll forever associated with the carefree days of childhood. And what better treat than to experience those characters “in the flesh” at Disney On Ice! So, to get you to your seats without any slips or slides of your own, here is our ultimate guide to getting the best tickets for your budget and squeezing out every last drop of icy magic from a visit to Disney On Ice. Enjoy! 1. Rinkside – these are a few rows of flat seating at ground-floor level right by the ice. There are generally three main sections, two running along each of the “long” sides of the ice; and another by one of the “short” sides. These seats are not tiered. 2. Lower tier – these are set further back from the ice than the rinkside seats and are tiered so each row is higher than the one immediately in front of it. 3. Upper Tier – another tiered seating level, further back and higher up than the seats in the lower tier. Where is the best place to sit at Disney On Ice? 1st place: Rinkside area, front row (top price). Before you roll your eyes and say “duh” – we should mention that this wasn’t a slam-dunk. Since the rinkside seats are at ground-level and very close to the rink, you can’t typically see the performers feet (not an insignificant point at an ice-skating show!) and the close-up position means you don’t quite get a sense of the action “as a whole”. Nevertheless, being so close to the ice means you can see the performers clearly and really appreciate the costumers; make-up and acting. There’s also a better chance of direct interaction with the performers who often wave back to people in the front rows etc. On balance, we think the immersive experience that comes from being up close and personal trumps the notes of caution sounded above and secures this area as our number one place to sit at Disney On Ice. 2nd place: Lower tier, around one-third of the way back/up – typically around rows 7 to 10 depending on the size of the venue (mid-high prices). Were you expecting that 2nd place would be row 2 in the rinkside area? Well, if we’re honest, maybe it should be. Pretty much all of the comments above will also apply to the second row in the rinkside seats. However, beyond the front two rows is where the rinkside seats become more tricky. Yes, they are still close up. But as they are all on one level, there is a risk of that somebody in front of you could block your view – even in the second row. If a five year-old is sat behind a taller child or an adult this could have a serious impact on their viewing experience. In addition, you and any children will have to remain seated for the duration of the performance since if you stand, you will be blocking people behind you. Disney On Ice is around two hours long and – particularly factoring in the excitement created by Disney’s magic – staying seated the entire time may be easier said than done! We’ve therefore selected the lower tier for second place. Why haven’t we recommended the front row of the lower tier? Well, once you’re out of the rinkside seats and into the lower tier, you need to be aiming at a sweet-spot which balances distance from the ice (nearer is better); and height (actually quite desirable…up to a point). In the front few rows of the lower tier, you’re significantly further from the ice than the rinkside seats, but not much higher. As a result, the downsides of being in the rinkside area (no “overall” view of the action, cannot see the skaters’ feet) still apply but you lose the upside of being very close to the performers. You also risk having your view obstructed by latecomers trickling into the rinkside area after the show has started. Taking that into account, our tip is to aim for somewhere around rows 7 to 10 if you are in the lower tier. These will typically be cheaper than rinkside seats and may also be cheaper than the front few rows of the lower tier so will often represent the best combination of viewing quality and value for money at Disney On Ice. Best seats on a budget: Upper tier, front two rows (mid to lower-mid prices). If the budget and/or availability of tickets is tight, you may need to look in the upper tier. In this case, try to find seats in the front two rows. Being too high up could be scary for some (adults and kids alike!) particularly in larger venues. In addition – to quote Elsa from “Let It Go” – it’s inevitable that sometimes, “some distance, makes everything seem small“. If you are thinking about sitting high up, be sure to check the situation regarding the number and location of big screens (if any). Children under two years of age usually don’t need their own tickets if they are going to sit on your lap for the duration of the show. Go to our venues page and if you’re going to a venue we currently cover, have a look through the photos for a general idea of the venue size and layout but remember that Disney On Ice seating plans are not the same as regular concerts. Please check the official Disney On Ice FAQs before booking tickets/attending. 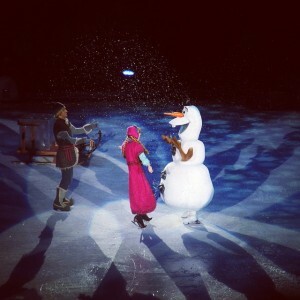 Bonus tips for getting the most out of your trip to Disney On Ice! Consider bringing earplugs – while the performers are great, the coachful of kids sitting immediately behind you crying and/or screaming out-of-tune Disney songs at the top of their little (but surprisingly powerful) lungs might not be as pleasant to listen to! Yes this tip may a bit “bah humbug” of us but don’t say we didn’t warn you! Bring binoculars – even if you’re not that high up kids will love looking through them for a close up view of the performers. Disney-inspired costumes are great (and a common sight) but be sure that the outfits will be comfortable to sit in and that temperature control is possible (think thin layers!). Feeding the kids (and yourself!) before the show – and bringing a few snacks/drinks along – can save a lot of money and stress! Bring a camera (or use a good smartphone) – Disney on Ice is a real treat and a visual feast so you’ll want to treasure the memories forever. Photos (without flash) are usually allowed provided they are for personal use only and you don’t bring any professional equipment (this would include tripods). It’s also usually ok to take video clips at the show for personal use. Please note: Rules on things like tickets for infants; brining your own food/drink; photography; and filming can vary from venue to venue so please double-check with your particular venue. If you’ve already bought your tickets and you’re worrying about where you’ll be sat, be sure to “LET IT GOOOOO, LET IT GOOOO!”. You and any little ones will be in for a real treat no matter where you are sitting and you’re now armed and ready with all the tips above for when you get home and want to book another visit straight away! We hope this guide has set you on the path to a magical experience at Disney On Ice. If you’ve found it useful (and/or if you disagree with anything!) please do leave us a comment below. If you have or go on to buy tickets, we’d LOVE for you to come back and let us know how it went and SHARE A PHOTO from the show that we can upload to our venue galleries to make this resource even better for our fellow fans! Topics/keywords: Disney on Ice, World of Enchantment, Worlds of Enchantment, view from block, best seats at Disney on Ice, where to sit, FAQs, view at disney on ice, frozen, rinkside, front row, lower tier, upper tier. Thank you for posting this! I’m especially thankful for your last tip. I was beginning to worry about our seats for our show this evening. Either way I’ll have a better idea for next time around! Still super excited!!! Note that our daughter is 5 years old.